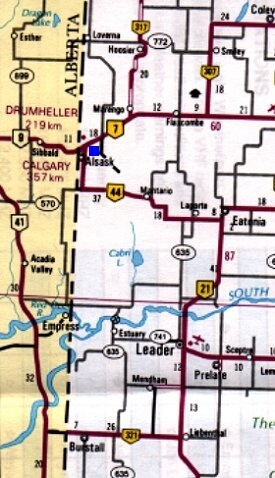 - (1998) Located at the junction of provincial highways 7 and 44 on the border of Alberta and Saskatchewan, hence its name. Located 184 miles west of Saskatoon SK and 225 east of Calgary, AB. Map 1 is courtesy Saskatchewan Tourism. Used with permission.